In meditating on this passage, we need to make some choices – guided, as always in lectio divina by feelings, not reason. For example, we can focus on the disciples, and Peter in particular, so that the passage speaks to us about our relationship with Jesus or with someone who has been Jesus to us. We then celebrate the times when we have been brought to see how our way of thinking was “human” and not according to God’s plan. – verses 24 to 27, a collection of sayings. I am proposing that we experience both sections as a unit, with the teachings flowing spontaneously from the narrative. This is always the teaching method of the bible – truth flowing from experience. We capture the power of the passage by situating it historically, remembering that the incident it relates came at a very significant moment in the life of Jesus. It is one all human beings pass through – a moment of truth. Up till then Jesus had been ministering in Galilee in the North of Palestine, far from Jerusalem in the South. He had met with great success at first: “he went round the whole of Galilee… his fame spread throughout Syria… large crowds followed him” (Matthew 4:23-25; cf. 7:18; 9:15). Opposition to him had grown, however, mainly from scribes (e.g. 9:11) and Pharisees (e.g. 12:1, 24). At this point in his life then, Jesus decided that the time had come for him to confront these opposing forces at the seat of their power, Jerusalem, home of the scribes and Pharisees (15:1). It was a decision which would have tragic consequences, but the passage shows that he accepted them fully (verses 21-23), basing himself on his understanding of every person’s life journey. The passage then invites us to celebrate similar “moments of truth” we have lived through, when we chose a course of action which we knew would cause hurt to people we loved and admired, and would bring us rejection and pain. We celebrate the great men and women who have inspired us by the way they entered courageously into their moments of truth – our saints, “personal” or “canonized”. We can also read it as the story of the Church (or of a group within it, like a religious order) taking a decision to be more radical in its following of Jesus. The passage is also a call to conversion in that it makes us more aware that we – as individuals and as communities – do not respond like Jesus. We pray that the spirit of Jesus will continue to live in our church, our families and the world. Our meditation will enable us to recognise the different characters in the narrative. Who are “the elders, chief priests and scribes” – the “experts” we must confront? Who is the “Peter” – a dear respected friend, and yet we must find the courage to say to him, “Get behind me”? Through meditation on verses 21-23, the sayings in verses 24 to 27 will no longer be abstract theories, but lessons about life which we have experienced concretely. We will be aware of the things we would have “lost” if we had tried to “save” them, of wonderful things we “found” because we took the risk of losing them. We will feel convinced that there is nothing we would “exchange” for the blessings which came to us as a result of our choices. We will naturally pray for those who are facing moments of truth at present, with compassion since we know the pain involved, and also with confidence, since we are aware that Jesus is living his story in them. but we were confident that in time we would be raised up. by renouncing ourselves and taking up our cross. We are truly grateful now that we stuck by our decision. and lost the deep joy we have experienced? which we would exchange for the satisfaction we have had? – a sense of achievement. We discover them as life-giving only if we take the risk of losing them. no matter how experienced or how holy they are. and will reward us according to our behaviour. and even invoke your name in doing so. to reward all according to their behaviour. Jesus always kept his destiny in mind while making decisions. – religious groups considered marginal. others from the world of academia, business or the professions. but according to its behaviour. In today’s gospel we hear the call of Jesus to become his followers. This is no easy invitation: ‘If anyone wants to be a follower of mine, let him renounce himself and take up his cross and follow me.’ We enter into the cross of Jesus, and begin our following of him, when we are baptised. It is at that moment that we become members of this body that can gather at the Lord’s table, and it is the grace of baptism that sustains us on the difficult road of following the Lord of life, and goodness, and truth. So now let us recall the fact that we are a baptised people, and ask God to bless us and strengthen us to continue following his Son. Christianity is about doing the heavenly Father’s will. When we relate these statements to one another, we start to glimpse that Christianity is not a ‘well-designed consumer product’. 3. Community. Community is problem for us as we are convinced that others get in our way and limit our choices. Most contemporary visions of a happy ‘society’ are based on the notion that everyone will be happy if there is as little restraint on their activities as possible and the only limit is that We should not get in the way of others doing ’their thing’. At the same time, we are people who crave companionship, crave acceptance, and fear being alone. A pretty mixed up situation. But Christianity is built on the notion of being gathered from being scattered and lost individuals into a community. We talk about the importance of caring for one another; loving self, indeed, but to the extent that we love others; acting as sisters and brothers in the family of the Father, and gathering each week as a community not because we as ‘individuals’ like the idea, but because this is the will of the group. 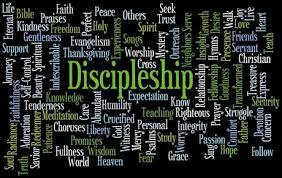 Being disciples also involves community, for we are part of a group around our teacher and we become his body by working together. 5. All these ideas come together in what we say about the for­mal act of becoming disciples: baptism. • Baptism is about following Jesus by joining him in death and resurrection. • Baptism is about joining the community and declaring that we wish to belong to it. 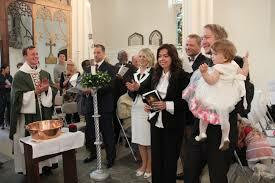 Are we ready now to declare that we wish to renew our baptismal promises? When Jesus told his disciples that he was going to Jerusalem and would suffer grievously there, and be put to death and then rise again, they must have been confused and distressed. Peter had been appointed the rock on which Jesus would build his Church. Now he was hearing that Jesus was going to be put to death. Impetuous as ever, Peter remonstrated with Jesus, saying that this could not be true. Jesus was the Christ, the Son of the living God — Peter had acknowledged this earlier and Christ had confirmed it, pointing out that it was God who had inspired this knowledge in Peter. So how could the Son of God be about to suffer and die? The faith that had led to Peter’s insights about Jesus being the Messiah had now deserted him. In turn, Jesus’ response to Peter’s hostile reaction to his future suffering was stern, unlike his warm words when Peter had affirmed his belief that Jesus was the Son of God. He castigated Peter: ‘Get behind me, Satan! 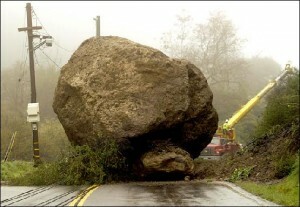 You are an obstacle in my path, because the way you think is not God’s way but man’s’ (Mt 16:23). Jesus then described the essential condition of being one of his followers, and this condition would apply to Peter, the first pope, just as much as to the humblest disciple: ‘If anyone wants to be a follower of mine, let him renounce himself and take up his cross and follow me’ (Mt 16:24). For the disciples, this teaching must have seemed incomprehensible. Even today, many people resist the idea of having to embrace suffering. Yet dealing with suffering is at the root of the Christian life. The willingness to appreciate the transformative value of suffering is a pre-requisite for authentic Christian living. Recognising the disciples’ incomprehension, Jesus sought to make them understand. He told them that, in order to gain eternal life, they must lose this life —their attachment to the things of this world. Nothing matters more than pleasing God. 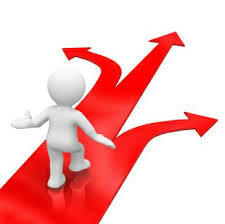 Jesus posed a crucial rhetorical question: ‘What, then, will a man gain if he wins the whole world and ruins his life? Or what has a man to offer in exchange for his life?’ (Mt 16:26). What, Jesus asked, is more important than saving the soul? If we lose our soul, what joy will the pleasures of this world bring us? None. On the contrary, they will haunt us throughout eternity as the cause of our downfall. Jesus reminds us, as he reminded his first disciples, about this possibility: ‘For the Son of man is going to come in the glory of his Father with his angels, and, when he does, he will reward each one according to his behaviour’ (Mt 16:27). In summary, then, the reality of Christian living is that we are challenged to be fully prepared to suffer for the kingdom of heaven. We need to be clear in our minds and hearts about the central importance of saving souls. That is our greatest task while living in this world. We meet deep human concerns and feelings in the gospel today. Peter is shocked to the core that Jesus would die; so shocked that he always later seemed to forget that Jesus promised that he would rise on the third day. Jesus talks very seriously about the cost of following him, like the cost of following any commitment in life. Jesus invites us to live at the deepest level of ourselves. In the area of life where we live and love, laugh and cry, worry and en­joy, hurt and forgive. In all these very personal sides of life, Jesus dwells, since he says that he makes his home in us. We can call it a sort of “third day’ hope. Nothing except love, which is eternal, was final for Jesus. For all the worst things of life there was a third day. The day on which hope would be full­er than any despair, and when life would be more lasting than death. Jesus was like that – when people met him, they remem­bered him and remembered how he touched the fears and anxi­eties of their lives with a deep hope. We are “third day” people, knowing that the love and life of God, promised at our baptism, will always be in the air around us, filling us with the breath of God, and breathing fragrance all around us like the best of flowers. Later they would be raised from final despair and hopelessness at his resurrection. But it took time! Peter’s confession of faith (last Sunday’s Gospel) begins a new phase of Matthew’s Gospel. As he makes his way to Jerusalem, Jesus’ teachings will now be addressed primarily to his disciples on the events and work that awaits them in Jerusalem – and beyond. The hostility between Jesus and the leaders of Judaism is about to reach the crisis stage. In today’s Gospel, Jesus proclaims unambiguously that his mission as the Messiah includes suffering and death. Peter is sharply rebuked by Jesus for his seemingly innocent remark that Jesus should be spared such a fate, but Jesus sees Peter’s refusal to accept such a possibility as a “satanic” attempt to deflect the Messiah from his mission of redemption. To avoid suffering and hardship in order to opt for the easy and safe course is purely human thinking, an obstacle to experiencing the life of the Spirit. Authentic discipleship involves taking on the cross and “denying oneself” – disowning ourselves as the center of our existence and realizing that God is the object and purpose of our lives. Jesus asks his disciples to detach from the ephemeral and shallow in order to attach to the lasting, fulfilling things of God: compassion, reconciliation, justice. The cross that Jesus asks his followers to take up is not a cross that cedes to crucifixion but a cross that is the means to resurrection. In embracing Jesus’ spirit of humble servanthood and compassion, we take up his cross, not out of a sense of self-loathing or pessimism, but out of a sense of conviction and hope that the demands of the cross will result in the life and love of the Easter promise. Christ urges us to “lose” that part of our life that is centered in ephemeral, perishable things so that we may “gain” lives grounded in the love of God: to lose our anger, our disappointment, our need for control in order to find meaning and purpose in doing for others and contributing to the common good. In “dying” to ourselves we become something greater; in letting go of the temporary and the fleeting we become richer; in the suffering we endure we become stronger, in the failures we experience we become wiser. When Brian Doyle was 13, he spent a “life term” — all right, 14 days — at a Boy Scout summer camp. Young Brian quickly established himself as the worst camper there. Tracking, swimming, canoeing, archery, woodcraft — the bespectacled Brian exhibited no talent or competence whatsoever. His happiest times were just sitting on a knoll among the trees watching for birds and wondering about lunch. Writing in The Christian Century (June 28, 2011), Brian remembers his experience with the Flying Eagle Patrol with surprising wonder and gratitude. “I wonder now that the Flying Eagle Patrol was so gentle to me, it’s most useless member, and these were the years when boys were cruel to each other, for fear of being least and weakest; but they were kind, and I remember their totally genuine delight when I earned my single merit badge, for making both a roaring fire and a stew. I remember their faces, around that startling fire, how they laughed — not at me for having finally done something well, but at the surprise of it; the gift of unexpectedness, perhaps. Or maybe they were smiling at my probably hair-raising stew; but they ate every scrap of it, and the one among us who was best in the woods was the Eagle who quietly washed the pots and plates. The Flying Eagle Patrol not only taught young Brian how to survive in the woods but also mirrored Jesus’ vision of a community of disciples grounded in his example of selflessness and service. Such a church, centered in the reality of the cross and the certainty of the resurrection, represents a value system that runs counter to our own; it compels us to make choices we would rather not make or opt for, to put ourselves and our own needs second for the common good, to step back to lift up the fallen and slow down to enable the weak and struggling to play their part in the life of the common good. The life of the true disciple of Christ is one of generous, selfless and sacrificial service to others in order to bring the joy and hope of the resurrection into our lives and theirs. Scouts honor! Here is the story of three Christians who accepted the challenge of Christian discipleship given in today’s Gospel, by “denying themselves, taking up their crosses and following Jesus." Twenty-three year-old Valerie Price went to Somalia to work as a nurse. She wanted to help people who had nothing. She wanted to offer them a better way of life. Valerie was concerned about her safety, but nothing could stop her from doing her work. She was put in charge of a feeding center in Mogadishu. Through her efforts, children who had been near starvation were fed. Valerie even established a school so the children could learn and have some hope for the future. She became nationally known for her committed service. Valerie, however, was killed by armed bandits outside the school she had started. She was willing to risk her life to help other people. Maximilian Kolbe was born in Poland. It seems that his early years – while good – were not that remarkable. He was devoted to Mary. He became a priest. His faith was important to him. But when the Nazis invaded Poland in 1939, Kolbe saw the writing on the wall. He knew that if he were to be a person of Faith – and be true to his Faith – he would probably have to suffer. In February 1941, because he spoke out against the horror of the Nazis, he was arrested and imprisoned at Auschwitz. On July 30, 1941, a prisoner escaped from Auschwitz, and in retaliation, the commandant of the camp lined up the inmates of cellblock 14 and ordered that ten of them be selected for punishment. They would be consigned to an underground bunker and starved to death. Ten men were selected. One of them, Francis Gajowniczek, cried out in tears, “My poor wife and children! I will never see them again.” At this point Maximilian Kolbe stepped forward and volunteered to take his place. The commandant accepted his offer, and so Fr. Maximillian Kolbe assumed his place among the condemned. By August 14, Kolbe was dead, his body cremated in the camp ovens. Dom Helder Camara was an Archbishop of the poorest and least developed Archdiocese of Brazil. But he has been described as "one of the shapers of the Catholic Church in the second half of the twentieth century." Early in his life, he was part of a conservative political movement inspired by Italian Fascism. But as he became more and more involved in pastoral work in Rio de Janeiro, he became increasingly affected by the poor. In trying to relate the message of the Gospel to their sufferings, he underwent a radical conversion which finally reached the point where he himself was labeled a Communist and called “the red bishop.” His was an outspoken witness for peace and social justice in a land ruled by a brutal military dictatorship. Dom Helder’s message was reflected in his style of leadership. Instead of a pectoral cross of gold or silver, he wore a simple wooden cross. He moved out of the bishop’s palace and lived in a much poorer house. He encouraged the training of lay catechists and opened the seminary doors to lay people and women. His own door was always open to any who sought him, and he presented himself as truly the servant of the people. His house was sprayed with machine-gun fire, his diocesan offices were repeatedly ransacked, he was banned for thirteen years by the government from any public speaking, the newspapers were not permitted to mention his name, and even the Church in Rome continually questioned his orthodoxy. When he retired as Archbishop of Recife, his conservative successor reversed nearly all his initiative. He died on 27 August 1999, aged 90. But his spirit lives on. Valerie and Maximillian Kolbe and Don Helder Camara did not choose to suffer – they chose to live the Gospel, to be true to the covenant God offered them. Valerie wanted to serve the poor – she didn’t want to be shot to death. Maximillian Kolbe wanted to preach the Gospel in every way possible – he didn’t want to be starved to death. Don Helder Camara wanted to be with his people – he didn’t want to be reviled. Jesus’ call to be extremophiles or "extreme-lovers." Probably, you've never met these creatures called "extremophiles." This is because they are extremely small microorganisms which live in environments where the Fahrenheit temperature ranges either from 170 to 215 degrees (water boils at 212 °F), or several degrees below freezing point -- or in acidic media. One such extremophile is Pyrococcus furiosus. Pyro is only one of many microorganisms attracting the attention of scientists today. Biotechnologists are learning a lot from such microorganisms living way out there, in dangerous places like hot springs, polar ice caps, salty lakes and acidic fields. They live in conditions that would kill humans and most plants and animals. Extremophile microbes are also busy industrialists, reports The Futurist magazine, because they produce enzymes that are enormously useful in the food, chemical, pharmaceutical, waste treatment and other industries. Suppose you need an enzyme to replace bleaching by Chlorine. If so, you contact Diversa Corporation, a California biotech firm, which tells you that a bleaching enzyme produced by a Pyro and some of his hyperthermophilic relatives living in the steaming geothermal springs of Yellowstone National Park could provide an alternative to chlorine in paper-whitening processes. (Cynthia G. Wagner, "Biotech Goes to Extremes," The Futurist, October 1998). Today's reading points us to the Greatest Extremophile of all time. In the district of Caesarea Philippi, Jesus reveals himself to be an extremophile, showing his disciples that "he must go to Jerusalem and undergo great suffering at the hands of the elders and chief priests and scribes, and be killed, and on the third day be raised" (Matthew 16:21). When Peter objects to this extremely painful prediction, Jesus rebukes him sharply: "Get behind me, Satan! ... you are setting your mind not on Divine things but on human things." He then tells his disciples: "If any of you wants to become my follower, you must deny yourself and take up your cross and follow me. For whoever wishes to save his life will lose it, but whoever loses his life for my sake will find it." (16:24-25). Valerie was a nobody. In 2010, though, 23-year-old Valerie Price went to Somalia to work as a nurse. She wanted to help people who had nothing. She wanted to offer them a better way of life. Valerie was concerned about her safety, but nothing would stop her from doing her work. She was in charge of a feeding centre in Mogadishu. Through her life-saving efforts, children who had been near starvation were fed. Valerie even established a school so the children could learn and have some hope for the future. Valerie was fortunate to see some of the fruits of her labours. Earlier this year Valerie made the national news. She was killed by armed bandits outside the school she had started. Valerie was willing to risk her life to help other people. Jesus tells us that in losing her life she actually found it. Application: Are we ready to put ourselves out, endure hardship, or even lose our lives for Jesus? In today’s Gospel, just as Jeremiah spoke of his sufferings, Jesus seems to prepare his disciples for his approaching passion and death. Like Jeremiah, Jesus has to face the consequences of his relationship with God and his mission on earth, which will lead to his passion and violent death. 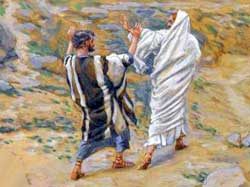 Peter tries to deflect Jesus from the path that lies ahead. He is like so many of us who want to protect those whom we love respect and care for. Peter took Jesus aside and rebuked him, saying, “Lord! This must never happen to you.” “Don’t talk about suffering! Can’t we find an easier way? Can’t we compromise and find an equitable solution that does not cause pain?” Jesus denounces Peter: “Get behind me, Satan!” Then turning to the crowds Jesus puts the demands of the Gospel with all that they entail. Whether anyone comes after him is voluntary, but once they choose they must know that His path is not an easy comfortable path, it demands constant self denial, a saying ‘No’ to oneself and ‘yes’ to God. He then placed before them this paradox of Christian and human life. “Whoever wishes to save his life will lose it and whoever loses his life for Jesus’ sake will find it.” Strangely, those who are truly living are those who have never stopped finding ways of loosing themselves in other people for Jesus’ sake. There is not one of us who would not wish to shield those we live from suffering. The parent is always on the lookout to protect the young from all the human hazards that face every child on the road to maturity. To spare a loved one pain brings a deep fulfillment and joy. St Peter was no exception. The bond between him and Christ had grown deeper over the previous months so he was horrified when Christ spoke of his future suffering in Jerusalem. Peter would have none of that nonsense. He assured Christ that such talk was out of place. But of course, it was not out of place. In God’s plan Christ was to suffer and die on his road to resurrection and glory, on his journey to open up for us the eternal life of God. In his agony, Christ was lonely and afraid but he knew that the Father would not desert him no matter what happened. The road of suffering is the road of life travelled by many. It is good to know that Christ travelled it despite Peter’s protests which we hear in today’s gospel. It is reassuring to believe that the Father will never desert us no matter what our agony. Albert Cylwicki in ‘His Word Resounds’. “What good will it do you, even if you gain the whole world, if you lose your soul?” These are good words to recall when we are faced with important and difficult choices. Here is a modern example. The scene: a prison for political prisoners neat Moscow (during the era of Stalin). Ivan, knew at once that they wanted something from him. “Would you like a remission?” they asked him. ”What do I have to do?” he asked. “We’d like to transfer you to another prison to take charge of an important project. If you agree, you will be free in six months.” “What is the project?” “We want you to perfect a camera that works in the dark, and another miniature one that can be fitted to the jamb of a door, and which works when the door is opened. We know you can do this.” Ivan was perhaps the only person in the whole of Russia who could produce a blueprint for these devices. After seventeen years in prison the idea of going home appealed to him. Here surely was the answer to his wife Natasha’s prayer. All he had to do was invent a device that would set him free. “Could I not go on working on television sets as I am at present?” he asked. “You mean you refuse?” said the general. Ivan thought: Who would ever thank him? Were those people out there worth saving? Natasha was his lifelong companion. She had waited for him for seventeen years. “I couldn’t do it,” he said at last. “But you’re just the man for the job,” said the general. “We’ll give you time to make up your mind.” “I won’t do it. Putting people in prison because of the way they think is not my line. That’s my final answer.” Ivan knew what his ‘no’ meant. A few days later he was on a train to Siberia to work in a copper mine where starvation rations, and probable death awaited him. No fate on earth could be worse. Yet he was at peace with himself. Nelson Mandela spent twenty-seven years in prison or ten thousand days (approximately). Before that he was on the run for a couple of years. Of the time he was on the run he wrote later: It wasn’t easy for me to separate myself from my wife and children, to say good-bye to the good old days when, at the end of a strenuous day at the office, I could look forward to joining my family at the dinner table, and instead to take up the life of a man hunted continuously by the police, living separated from those who are closest to me, facing continually the hazards of detection and of arrest. This was a life infinitely more difficult than serving a prison sentence. (Long Walk to Freedom, 1994, Little, Brown and Company) What drove him to make such great sacrifies was his love for his country. 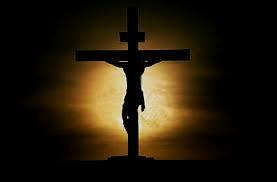 This was the ‘cross’ he carried because of his love for his people. In the 1998-99 persecutions against Gujarat’s Dangi Christians, many tales of faith fortitude went unrecorded. I still remember the battered and bleeding youth, Sitaram Devasyabhai, who told me, “I will not give up Christianity even if they kill me!” earlier in Karota village of the Dawada mission where I served as priest, Poslabhai Vasava confessed, “I find great strength in Jesus crucified although friends joke that I adore a helpless, naked deity.” A young Christian from Mumbai, Neil Gaikwad gave witness to self-sacrifice. For twelve hours during torrential rains that submerged Mumbai in July 2005, he swam to save the lives of 60 people trapped in a bus. Eyewitnesses said, Neil must’ve gone up and done 40-50 times to take people out.” Texan Lance Armstrong too combated cancer and went on to win the prestigious Tour de France cycle-rally on July 24, 2005, for an unprecedented 7th time in succession. Neil and Lance demonstrate that life comes through dying to self, and all Crossroads lead to Heaven. I sat paging though my old schoolbook. “I came to a page that was folded down. "I won't do it! That's my final answer." In a prison for political prisoners near Moscow, during the Stalin era, Ivan, a prisoner and expert in physics and optics, sat facing the prison governor and army general. Ivan knew at once they wanted something from him. "Would you like a remission?" they asked him. "What do I have to do? What's the project?" he asked. "We want you to perfect a camera that works in the dark, and another miniature one that can be fitted to the jamb of the door, and which works when the door is opened." Ivan was perhaps the only person in the whole of Russia who could produce a blue print for these devices. After seventeen years in prison the idea of going home appealed to him. Here surely was the answer to his wife Natasha's prayer. All he had to do was invent a device that would put a few unsuspecting fools behind bars in his place, and he would be free. "Could I not go on working on television sets as I am at present?" he asked. "You mean you refuse?" asked the general. Ivan thought: Who would ever thank him? Were those people out there worth saving? Natasha was his life-long companion. She had waited for him for seventeen years. "I couldn't do it," he said at last. "But you're just the man for the job," said the general. "We'll give you time to make up your mind." "I won't do it. Putting people in prison because of the way they think is not my line. That's my final answer." Ivan knew what his 'no' meant. A few days later he was on the train to Siberia to work in copper mines where starvation rations, and probably death awaited him. No fate on earth could be worse. Yet he was at peace with himself. Jesus talked of losing life, but he also talked of gaining life. This death to self is, in fact, the entrance to a higher life. It is death for the sake of life. When a talented small town Southern lawyer Kevin Lomax, discovers his client is guilty, he goes to the restroom to compose himself. He returns to the courtroom, humiliates the prosecution's young witness and emerges victorious. Soon after, he is offered an opportunity to join a prestigious firm in New York. His wife is uncertain about the move and his very religious mother is against it, but he joins and strange things happen in New York. Kevin's wife is lonely and hallucinates, Kevin's confidence in his work begins to falter, he is attracted to a female lawyer and his relation with his wife suffers. He gets a wealthy but guilty businessman acquitted of murder charges. Kevin's wife claims that she has been assaulted by John Milton the company's head. When Kevin confronts Milton he discovers that Milton is the devil incarnate who offers Kevin the world and the opportunity to sire an Antichrist. Milton reveals that Kevin is actually his son, and Kevin put a gun to his head and pulls the trigger. Suddenly, Kevin is back in the restroom where he had gone to plan the next move for his guilty client. He decides to do the right and noble thing - to discontinue defending the client, knowing that he will be disbarred. But as he leaves the courtroom, a journalist asks Kevin for an interview that will make him a celebrity. The Devil's Advocate deals explicitly with sin and the screenplay raises themes of God, the devil, salvation, damnation and freewill. The film is about choices people have to make to live an upright life with all its challenges, or to live an easy life that leads to doom. Jesus, in today's gospel, reminds us that we have to make a choice for him or for the Satan. The way of the devil is attractive and comfortable. The way of the Messiah is the way of the Cross, hard, challenging but in the end fulfilling. To play the role of a leader, a prophet is never easy and entails readiness to face hardship and suffering. Nelson Mandela spent twenty-seven years in prison or ten thousand days approximately. Before that he was on the run for a couple of years. Of the years he was on the run, he wrote later in the Long Walk to Freedom: "It wasn't easy for me to separate myself from my wife and children, to say good-bye to the good old days when, at the end of a strenuous day at the office, I could look forward to joining my family at the dinner table, and instead take up the life of a man hunted continuously by the police, living separated from those who are closest to me, facing continually the hazards of detention and arrest. This was a life infinitely more difficult than serving a prison sentence." In the 1984 Olympics in Los Angeles, 16 year old Mary Lou Retton became the first American girl to win a gold medal in gymnastics. To accomplish this extraordinary feat, she had to make many sacrifices during her two year period of intense training prior to the Olympics. While other teenagers were enjoying themselves with a full schedule of dating and dancing, Mary Lou Retton could only participate on a very limited basis. To improve her skills she had to practice long hours in the gym; to nourish her body properly she had to follow a strict diet, and to increase her confidence she had to compete frequently in meets. But what Mary Lou Retton gave up in terms of good times and junk food was little compared to what she gained in self-satisfaction and public acclaim when she won her Olympic gold medal. What she lost in the usual social life of a teenager she found in the special setting of becoming a champion gymnast -acceptance, camaraderie and respect. Mary Lou Retton's Olympic experience illustrates Christ's paradox in today's scriptures. Eugene Orowitz was a skinny, 100-pound sophomore at Collingswood High at Collingswood, N.J. One afternoon the gym coach held classes in the middle of the track field to show the kids how to throw a javelin. After instructions he let the kids try their hand at it. The longest throw was 30 yards. "You want to throw it too, Orowitz?" the coach asked Eugene. The other kids laughed at Eugene. Someone shouted "Careful! You'll stab yourself!" Eugene pictured himself as a young warrior about to battle the enemy; he raised the javelin and threw it over 50 yards till it crashed into the empty bleachers, its tip broken. The coach ignoring his feat, looked at the broken head and said, "What the heck Orowitz, you broke the thing. It's no good to the school any longer." That summer Eugene began throwing the javelin in a vacant lot. By the end of the year he threw the javelin 211 feet, farther than any high schooler in the nation. He was given an athletic scholarship at the University of Southern California and he began dreaming of the Olympics. Then one day he didn't warm up properly, and tore the ligaments of his shoulder. That put an end to javelin throwing, his scholarship, and his dreams. Eugene dropped out of college and took a job in a warehouse. -The tragic story of Eugene Orowitz raises a vexing question. Why does God let misfortune wreck the lives of so many good people? I like the story of the young man, eager to make it to the top, who went to a well-known millionaire businessman and asked him the first reason for his success. The businessman answered without hesitation, "Hard work." After a lengthy pause the young man asked, "What is the SECOND reason?" We want to deal this morning with the lure of the easy way. Jesus and His disciples were at Caesarea Philippi. Their ministry to this point had been a stunning success. Crowds pressed in on them everywhere they went. People eagerly reached out to touch this attractive young teacher from Nazareth. The disciples themselves were caught up in the excitement of it all. Jesus asked them, "Who do you say I am?" and Simon Peter answered enthusiastically, "You are the Christ, the Son of the living God!" It was one of the most dramatic moments in the disciples' pilgrimage with Jesus. Then Jesus changed the subject. He began to tell them that the crowds would soon turn against Him; He would be crucified, on the third day he would be raised. The disciples didn't know what to make of all this. Simon Peter took Jesus aside: "Forbid it, Lord, that these things should happen to you." Jesus' response to Simon Peter is as harsh as any words in the New Testament: "Get behind me Satan! You are not on the side of God but of man." Perhaps Jesus called Simon Peter 'Satan' because of Jesus' experience in the wilderness immediately after His baptism by John. In today's parlance, it was there that Satan revealed to Jesus the way to make a million dollars in three easy steps turn stones to bread, leap off the pinnacle of the temple, "Bow down and worship me!" I see Satan not as a red caped figure with a pitchfork but dressed in a $400 suit and offering in a glib and polished tongue instant success, instant glamour, instant gratification. We can see Satan almost anywhere today. Jesus encountered him this time in Simon Peter: "Forbid it, Lord, that you should have to suffer and die." If there is any doubt that Jesus is resisting the lure of the easy way, listen to the words that follow: "If any man would be my disciple, let him deny himself and take up his cross and follow me." We are the devotees of the easy way even though everyone in this room knows two important truths. 1. The Path to Personal Success Is that of Self-Denial. 2. Self-Denial Is Essential to the Salvation of the World. Although autumn does not officially start until September 23, we all know that this weekend, Labor Day Weekend, signals the end of summer. The "holiday" season is over. It is time to "get back to work" Tuesday morning. And we all, all generations, know it - whether we are in kindergarten class or on a corporate totem pole. After Labor Day it is "business as usual." No more holidays. Holidays used to be "holy days," times to mark the moment by calendar days which paid special attention to historic happenings, commemorated special events, and celebrated significant milestones. Instead of acknowledging the sacrifice of the saints, this weekend is all about one last barbecue, one last swim in the lake, or maybe one last packing up a kid heading off to college. It is a "holiday" that is important, but not really a "holy day." One of the least celebrated, but most participated in "holidays" in the United States falls on April 17, although it is "moveable feast," depending on who is in office and how active our politicians. It will probably get pushed back a few days more in the next several years, but right now the "holiday" of note falls on April 17. Anyone know what I'm talking about? It is "Tax Freedom Day." From January 1 through April 17 all the income you earn goes to pay your taxes. Not a fun fact. But as of April 17, or 18, or 19, depending upon your tax bracket, you are free. For the rest of the year you are working, and earning a living, to support your own family, to pay down your own mortgage, to keep your own bills from taking over your life. But for 107 days of the year, everyone is working to pay off their taxes. And we're not the only ones. Someone described London as filled with "the exhausted, the timid. The burgled, raped, assaulted. Overtaxed. Under-­rewarded. Choked on thin air. Allergic to everything." It is said that St. Augustine was accosted one day on the street by a former mistress sometime after he had become a Christian. When he saw her he turned and walked the other way. Surprised, the woman called out, "Augustine, it is I". Augustine as he kept going the other way, answered her, "Yes, but it is not I." It is an amusing story - one that comes close to making the same point the German theologian Dietrich Bonhoeffer made when he wrote "When Christ calls a man to follow him, he calls him to die." Richard J. Fairchild, "In the Way or on the Way"
It doesn't seem to me that many of us are risking very much for our faith. I once heard someone describe the average Christian today in terms of a person dressed in a deep-sea diving suit, oxygen mask firmly in place, marching resolutely into the bathroom to pull the plug out of the bathtub. An old slogan says: "Expect great things from God; Attempt great things for God." We're pretty good at the first; not so hot with the second. Remember the words of Shakespeare: "Our doubts are traitors, And make us lose the good we oft might win, By fearing to attempt." (Measure for Measure, I, iv.) Peter at least dared to attempt. Cheap grace is the preaching of forgiveness without requiring repentance, baptism without church discipline, Communion without confession, absolution without personal confession. 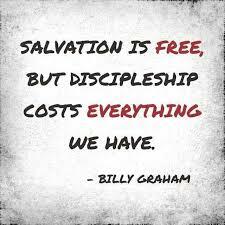 Cheap grace is grace without discipleship, grace without the cross, grace without Jesus Christ living and incarnate. Costly grace is the treasure hidden in the field; for the sake of it a man will gladly go and sell all that he has. It is the pearl of great price to buy which the merchant will sell all he his goods. It is the kingly rule of Christ, for whose sake a man will pluck out the eye which causes him to stumble, it is the call of Jesus Christ at which the disciple leaves his nets and follows him. Costly grace is the gospel which must be sought again and again, the gift which must be asked for, the door at which a man must knock. Such grace is costly because it calls us to follow, and it is grace because it calls us to follow Jesus Christ. It is costly because it costs a man his life, and it is grace because it gives a man the only true life. It is costly because it condemns sin, and grace because it justifies the sinner. Above all, it is costly because it cost God the life of his Son: "ye were bought at a price," and what has cost God much cannot be cheap for us. Above all, it is grace because God did not reckon his Son too dear a price to pay for our life, but delivered him up for us. Costly grace is the Incarnation of God. Recently I ran across a story that absolutely amazed me... and yet it's a story that may well represent the "cater-culture-give-'em-what-they-want world" in which we now live. A church wanted to improve attendance at their major worship services, so they hired a powerful advertising agency to come in, study their situation, and make recommendations. The ad agency did their research... and then suggested to the church that they should get rid of all the crosses in the church... because the crosses might send a negative message to prospective young worshippers! Now, I'm sure that in its history, that advertising agency has come up with some brilliant ideas... but, in my opinion, that was not one of them! We can't get rid of the cross! We don't want to get rid of the cross. The cross is the dramatic symbol of our faith, hope, love, and forgiveness. The cross is the powerful reminder of God's sacrificial and redemptive love for us. And the cross is the constant signal to us of how God wants us to live and love today... as sacrificial servants. We are not called to be prima donnas... We are called to be servants. We are called to take up the mission of Christ... and to emulate the servant spirit of our Lord. One of the early church fathers, a man named Origen, suggested that when Jesus said to Peter, "Get behind me, Satan," what he actually meant was, "Peter, your place is behind me, not in front of me. It's your job to follow me in the way I choose, not to try to lead me in the way YOU would like me to go." Certainly what Jesus said immediately after his rebuke of Peter would support that interpretation. He told all of his disciples, including Peter, that not only did HE have a task that was set before him by God, but that THEY also had work to do. 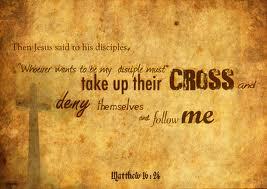 "Deny yourself, take up your cross, and follow me," Jesus said. "Get on this new thrill ride with me. There will be many dangerous twists and turns in the tracks, but I promise you it will never be dull. It will mean putting someone other than yourself first, being concerned not so much with what YOU want, but what God wants for you. It won't be easy and sometimes it won't be much fun, but it will never be boring." Bob Hodges, a Presbyterian minister in Rogersville, Tennessee, tells about duck hunting with a friend of his on Cherokee Lake in East Tennessee. His friend, Riley, who had just recently given his life to Christ, began to ask some serious questions about his Christian pilgrimage. Riley's old friends were making it very difficult for him to remain consistent in his obedience and commitment to Christ. They seemed to delight in trying to get him to fall back into the old patterns of life. They ridiculed him for spending so much time with "the preacher." Riley asked, "Why is it that I'm having more trouble since I became a Christian than I ever did when I was lost? Everything seems to go wrong. I'm having such a struggle!" Bob Hodges spoke up, "I'll tell you why, Riley. A couple of ducks fly over and you shoot. You kill one and injure the other. They both fall into the lake. What do you do? You have to get out of the boat and go pick up the ducks, but which one do you go after first?" "Well," Riley drawled, "that's easy. I go after the injured one first. The dead one ain't goin' nowhere!" Hodges said, "And that's the way it is with the devil. He goes after injured Christians. He's not going to bother with the man dead in his sin. But the minute you give your life to Christ, you'd better get ready; the devil is going to come after you. He is going to chase you; he's going to make it hard on you." Marketing experts are always quick to tell start-up businesses how important it is to develop a corporate logo. "Brand identity" they call it, pointing out that symbols serve to generate not only product familiarity but also identification with the overall philosophy of an organization. As the authors of one book on logo design state, "The success of any business or organization lies in its ability to persuade its audience to do what it wants. The ultimate goal of any designer when creating a logo is, of course, to develop a rhetorical and informative mark - one that not only identifies the company and its business, but also helps persuade viewers to respond in a specified manner." 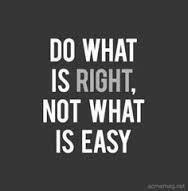 For Christians and other religious groups we might agree that the same holds true. The old adage, "a picture's worth a thousand words" reminds us that even around the spiritual dimensions of our lives we can be consistently and powerfully moved by a single sign or symbol. For the Jewish people it is often the Star of David, for Buddhists, the figure of their enlightened teacher, and for us as Christians the central "logo" of our life together is the cross, that sacred sign of God's sacrifice offered through Christ. Through this marking we're continually reminded of God's undying love for the world and of our call to love and serve one another throughout the course of our earthly existence. Sacrifice is not a word we use much these days, is it? When was the last time you used it or thought about it in terms of your own life? When was the last time you sacrificed anything for anybody? Come to think about it, there's only one sport as far as I know where the term is actually used. Do you know which sport that is? You can almost hear Harry Cary announcing it over the radio, "And there it goes, a long fly ball to left; easy out, but the man on third tags up and trots home. Sacrifice fly." What a great idea -- you're out, but you helped someone else score a run. Baseball is one of the few sports where you lose but the team still gains. Do you remember the way comedian George Carlin spells it out in his routine about the contrast between the hardness of football and the softness of baseball? He says: In football you Tackle! In baseball, you "catch flies..." In football you Punt! In baseball you "bunt..." Football is played on a Gridiron! Baseball is played on a "field..." In football you Score! In baseball you "go home..." In football you Kill! In baseball you "sacrifice..."